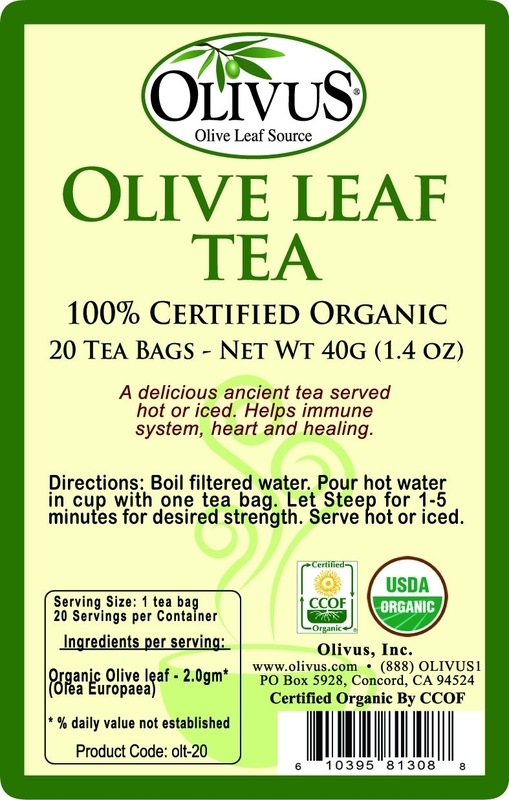 Enjoy the natural flavor of olive leaf tea and its healthful benefits. Olive leaf tea (Olea europaea) has all the benefits of olive leaf supplements plus it contains No caffeine! The taste is actually surprisingly pleasant (unlike our liquid olive leaf tincture) most similarly compared to a green tea. 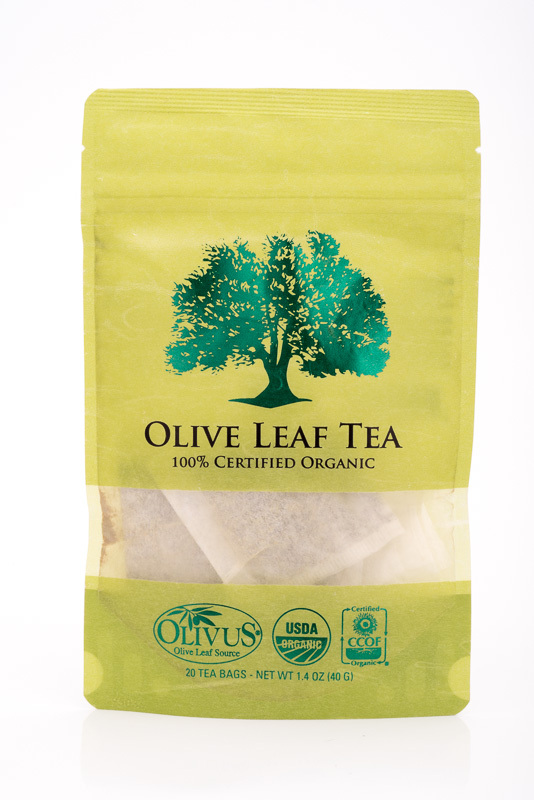 Olivus olive leaf tea bags contain 2g each. This 20 pack comes in an air-tight resealable bag. 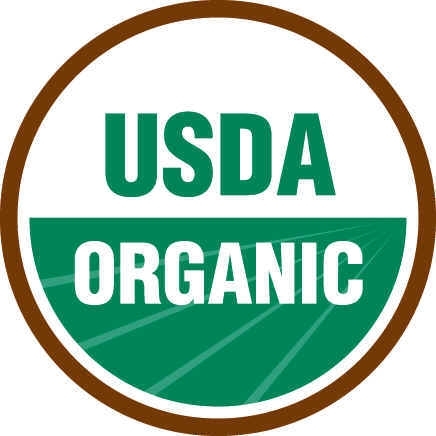 Raw leaf is imported from Spain and milled and packaged here in the U.S.A. We use only certified organic olive leaf, testing and documenting all raw materials for each batch made. Use tea bags individually or in combination with other teas, herbs or flavorings. Tea bags can be used for individual cups of hot tea, or as iced tea (4-6 bags per quart). Absolutely love the tea... I drink it everyday use two bags sometimes 3 instead of one.. BP normal also am sleeping so much better..
We use the tea bags and capsules. They are wonderful and really make a difference in how you feel and helping to control BP and other awesome benefits. This tea is a wonderful addition to my mornings. I can't go without it. My mood and body feel amazing everyday I drink this tea. It has a pleasant taste to it as well. This tea is a great alternative for my kids who are not good at swallowing pills. With a little honey, it is well received:)! I was pleasantly surprised at how much I like this tea flavor. It's rich buttery taste has prompted me to choose it instead of coffee when I need to cut back on it. I use one tea bag twice and it works great! I'll definitely be ordering again. Although I use the loose tea, I buy the teabags to give as gifts to friends. They are a no-fuss way to get started with olt and begin to reap its benefits to their general health. first of all, I am an olive leaf fan..big time! So, why not try the tea?? I wasn't disappointed.. it is very pleasant; a clean, honest taste. A great afternoon pick-me-up. I really enjoy this tea as it has a nice rich flavor. I don't care for weak tasting teas. And the added health benefits add to the enjoyment! I really enjoy sipping on a caffiene free tea that's known for it's health benefits. I can't find this product locally anywhere. I look forward to remaining a satisfied customer for years to come. I use the tea as a supplement to olive leaf tablets. I enjoy the healing benefits it gives and the energy boost I get when I drink it. 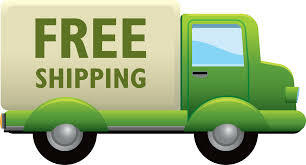 Plus, always prompt handling of my order and fast shipping by Olivus! Thank you. Great tasting, when brewed for 5 min. I use organic raw blue agave syrup to sweeten the tea. I keep a bag of the teabags in my desk at work and have one everyday. I get a lot of mileage out of one bag, usually 2-3 cups of tea. I was never big on tea but since trying the Olive Leaf Tea i have come to enjoy tea very much. It provides another level of protection that i need. Outstanding product. Olive leaf tea is a great energy booster without the jitters of caffeine. I recommend sweetening with Agave for the great taste and its lower glycemic than table sugar. This product is great. My mom loves it. She has diabetes and somehow it helps her metabolism and it helps her stay active. This is by far some of the best for you teas. the first sign of a cold and a few cups of olt and nothing can stand a chance. Q: When will the olive leaf tea bags be available? A: Our tea products are now restocked and available for purchase. Q: Does this product has any harmful substances? If yes, what are they? A: Our tea leaf is imported from Spain and is tested and certified to be organically grown per USDA regulation. Tea is a good way to begin consuming olive leaf for sensitive people. Q: Hi, does the olive leaf tea contain oleuropein and if so how much, in oppose to the capsules that contain 25%? A: Yes it has 1 - 5% oleuropein which is the naturally occurring amount in olive leaf. The same percentage is in all our certified organic products (tea, bulk powder, and organic capsules).